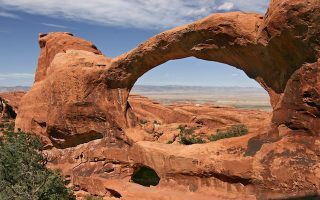 Amazing red rock landscapes, the Colorado River, two national parks, and good weather year-round make Moab one of the premier outdoor recreation areas in the United States. Moab is especially known as a mountain biking, trail running, and rock climbing mecca. 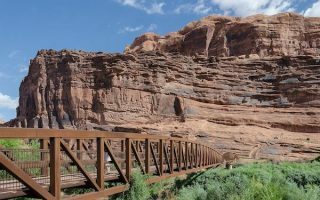 Our guide to running in Moab is more focused on more accessible road running and some moderate trail running. But there are also hundreds of miles of challenging, technical trail running here too, evidenced by the number of trail races, ultras, and the like. 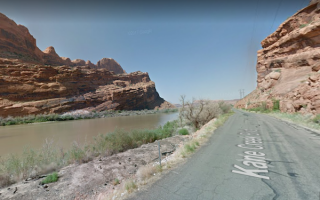 Some of the best places to run in Moab are along the growing network of paved multi-use paths, including Mill Creek Parkway, the Moab Canyon Pathway, and along Highway 128 around Lion’s Park. There’s great, flat running along the Colorado River on Kanes Creek Blvd. and Highway 279. For some gentle trail runs on a plateau with great views, head to Dead Horse Point State Park. Our guide also features running highlights in Arches and Canyonlands National Parks. Important Notes for Running in this Area: Weather can be very hot and dry in summer. And when it rains, there can be flash floods. Hydrate accordingly. Be aware of the nearly mile-high elevation. The rock around here is not called ‘slick rock’ for nothing! When running the trails, be aware of the potential for wildlife. A great off-road option through beautiful scenery. 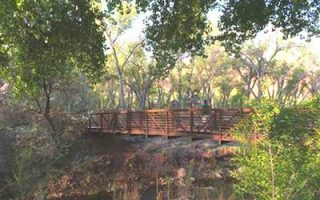 We especially recommend the first 3 relatively flat miles of this paved pathway, from the pedestrian/bike bridge that crosses the Colorado River on Highway 128, to Arches Scenic Drive. A pleasant flat and shaded option right in town. The paved 1.3 mile path runs from the center of town to Rotary Park, along Mill Creek. A nice way to see a bit of Moab. Bonus: nice running track near the trail head. 7 miles of more gentle trail running in this state park that sits 2,000 feet above the Colorado River. Wonderful views. 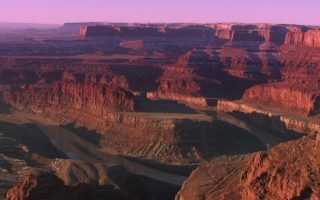 The East Rim Trail between the Visitor Center and Dead Horse Point is a highlight. The West Rim trail is more challenging. Gorgeous national park located in Moab. For a run in Arches, we recommend the Landscape Arch, a nice 2-mile route starting at Devils Garden Trailhead. Arches Scenic Drive is also runnable, but hilly and no shoulder. 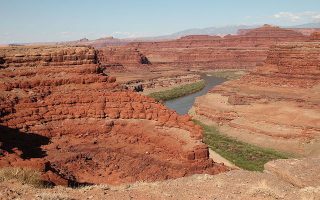 This area, near Moab, is a mecca for biking, hiking, climbing and other adventuring activities. Great running options in Canyonlands are Colorado River Overlook trail, Neck Springs, and a trail along Murphy Point Overlook. Summer in Moab is hot! 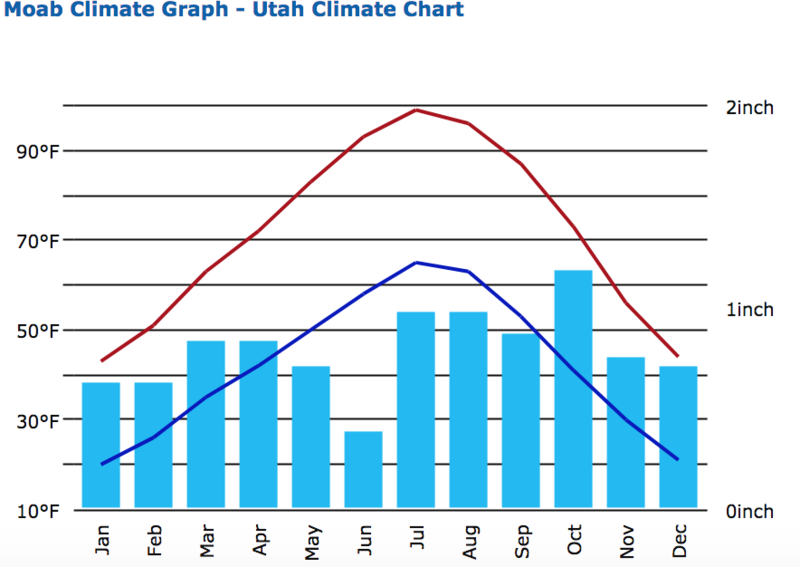 May through September daily highs are in the 90s to 100s Fahrenheit. With little shade and a very dry climate, midday runs should be avoided. Summer nights do cool off nicely, so early mornings/evenings are better for running. Winter is cool to cold, with average high temperatures in the 40s to around 50 and nights that dip to 20F. Bring layers! Sustained snow and ice are rare. 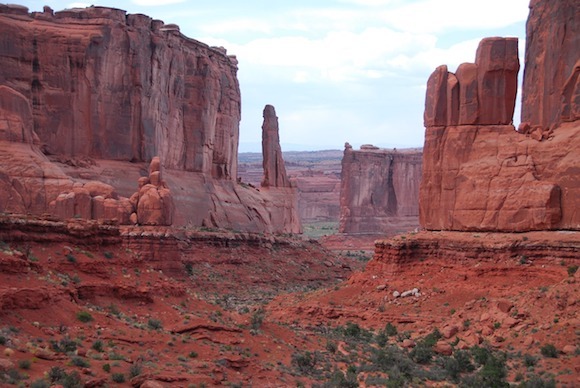 Moab is the gateway to the myriad outdoor recreation experiences in this area. There’s a good selection of hotels, camping, and other types of accommodations, but things tend to fill up in high season. Staying near the center of Moab will provide access to great running options in the area, as well as Arches National Park. Canyonlands is a bit further away but not a long drive. There are no independent running-only stores in Moab — but there’s a plentitude of outdoor sporting gear and cycle shops. You will not have trouble finding the gear you need — especially if looking for trail running shoes! There are tons of running events in Moab — many of the ultra and trail running variety. Here are a few signature events that mere mortal runners might consider. Mad Moose events. These guys put on a lot of great events in the area — the Arches Ultra (and half and 9k) in March, Canyonlands Half Marathon in March, the Other Half in October, the Winter Sun 10k in December, and more! Grass Roots Events. They put on some trail running races and also run guided trail running tours.